In 2003, the original inventor, John Stemple collaborated with BRP Corp to make new and replacement parts for the Stemple 76/45 receivers he manufactured prior to the 1986 cutoff. From this came a series of compatible drop-on parts for the unmodified/transferable Stemple 76/45 receivers known as Stemple Takedown Gun (STG) setups. Since nothing is welded or hand fitted to these receivers, changing setups and replacing parts is fast and easy. These are the most finely built and smooth running sub-machine guns on the transferable market. We build them for performance and durability, stock plenty of high-quality spare parts, and provide excellent service. Just about all of the parts we make for the Stemple 76/45 derive from the Finnish KP31, but so does the 76/45. The Stemple 76/45 is roughly a thick-walled version of the S&W 76 or M45. The S&W 76 design was heavily inspired by the Swedish K/Carl Gustov M45. The M45 uses the same barrels and magazines as the Swedish M37. The M37 is a short-barreled version of Finland's KP31. 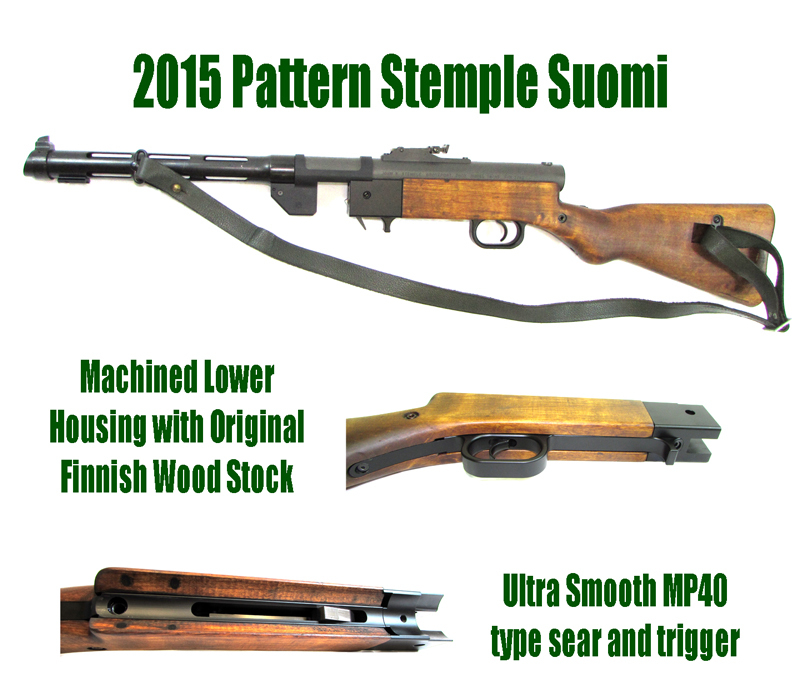 Since the Stemple 76/45 drew its roots from the Finnish KP31, it was a natural fit to use original Finnish and Swedish parts in the Stemple 76/45 system. STG-76W (Stemple Suomi 9mm): The Stemple Suomi closely resembles the original Finnish KP31 by using the original Finnish KP31 wood stocks, sights, and shrouds. 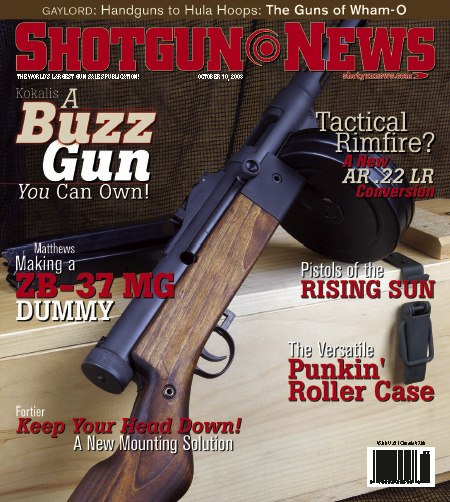 The KP31 had some of the nicest 'furniture' ever put on a a sub machine gun. It can be equipped with short M37 barrel/shroud, M31 barrel/shroud, or suppressed setup. Bipods are available for all patterns. To accommodate the sear location of the Stemple receiver, we designed as new trigger system based on the MP40. Similarly, this configuration is full-auto-only. Parts and Accessories Included With Each Gun: 1 x 36rd magazine, 2 x 70rd drums, bipod, multi-tool, sling, spare buffer, wooden transit chest (pictured below) and 2 spare picatinny accessory rails for the shroud mount bipod and top optic mount. Why the Suomi KP31 was so effective (approx 2 minute mark)... it's accurate, high capacity, and hard to run from, especially in the snow. The Stemple Suomi setup has all the same attributes.